A new report sheds light on the immense effort Israel is investing in attaining a coveted seat on the UN Security Council. A new report on Bloomberg details the immense effort Israel has been putting into winining a seat at the UN Security Council when its name comes up next year. Israel finds itself in a three way tie with Belgium and Germany, and many observers say that Israel has an outside shot to land its first-ever seat on the 15 seat body. “They’ve done their campaign with a level of sophistication which is remarkable, doing it systemically, arranging fact-finding missions and bilateral agreements,” Syed Akbaruddin, India’s ambassador to the UN, told Bloomberg. According to the report, Israeli Ambassador to the United Nations Danny Danon is personally heading the campaign, which has included wining and dining 24 ambassadors from around the world, taking them on exclusive trips to Israel, and hosting a dinner party in May for the ambassadors of 15 African nations. Netanyahu offered a clue to his aspirations in December, when he called on Kazakhstan's President Nursultan Nazarbayev to support Israel's Security Council bid at a joint press conference they held in Astana. "We helped you get accepted as a member of the Security Council and now we are asking you to help us be a member of the council" Netanyahu told him. Landing a spot on the Security Council would be a major feat for the Jewish state. The 15 member body is the most powerful of the 6 organs that make up the United Nations, and its powers include the establishment of peacekeeping operations, the establishment of international sanctions, and the authorization of military action through Security Council resolutions. Israel's vulnerability at the Security Council was evident this past December, when the US decided to let a resolution condemning Israel's "settlement" policy pass, breaking its long-standing policy of vetoing anti-Israel resolutions at the UN. 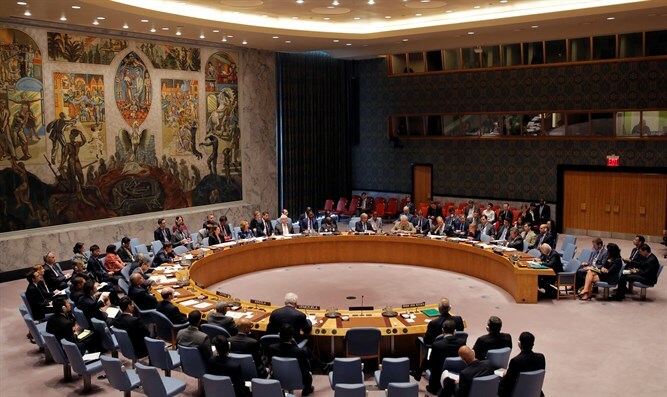 The US is one of the five permanent members of the UN Security Council which possess veto power, and is often the only force preventing a wash of anti-Israel resolutions. Israel is one of the 66 world nations which never held a seat on the body. Beating Germany and Belgium for the coveted position would be a major achievement for Prime Minister Netanyahu, who has long contended that rebuilding relationships with African and Asian nations, one of his diplomatic successes, would transfer into UN votes. "My goal is to erode the great blocking majority of 54 African countries that is the basis of the automatic majority against Israel in the UN and other international bodies," Netanyahu said in June before he set off on a major state visit to Africa. The elections for the 2019-2020 membership are to take place next November. Israel needs two-thirds of the votes, or 128 states, to support it in the General Assembly in order to gain acceptance to the Security Council.